Very limited interacting with people, but all were positive interactions and friendly people. Really enjoyed our stay and will very likely be back in the future. Thanks! Perfecto! Only thing I would like to add is that it needs a better tv and system. A beautiful location with great views and spacious condo's. Very easy to deal with & polite. Love the SW property. We see the same faces (employees) year after year and that is awesome. Grounds are well maintained and the property itself is peaceful and very family friendly. The beach is spacious and beautiful! Love Navarre. 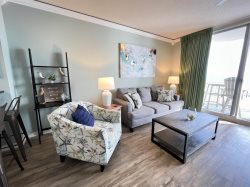 A great condo overlooking an amazing beach! Looking forward to returning! Third time here at the Summerwinds! Love this place!!! Easy in & out. Condo very comfortable and inviting. Derek was exceptional in accommodating our special needs. Because of Hurricane Harvey I was sent to Houston as part of a National Guard assistance team. Our reservations were locked in for this same time, but because of the disaster assistance I was unsure if we would make our scheduled reservation. After explaining our situation to Derek he spoke with his supervisor and they stated they would honor our reservation at a time convenient to us after I returned from Houston. This was more than my wife and I had ever expected for such last minute notice. My family has stayed at Summerwind for decades!